This edition is limited to only 350 in the world! 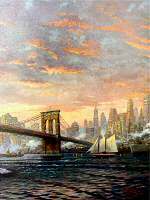 Thom painted the original The Spirit of New York on a canvas over 6 feet in length and 3 feet high! 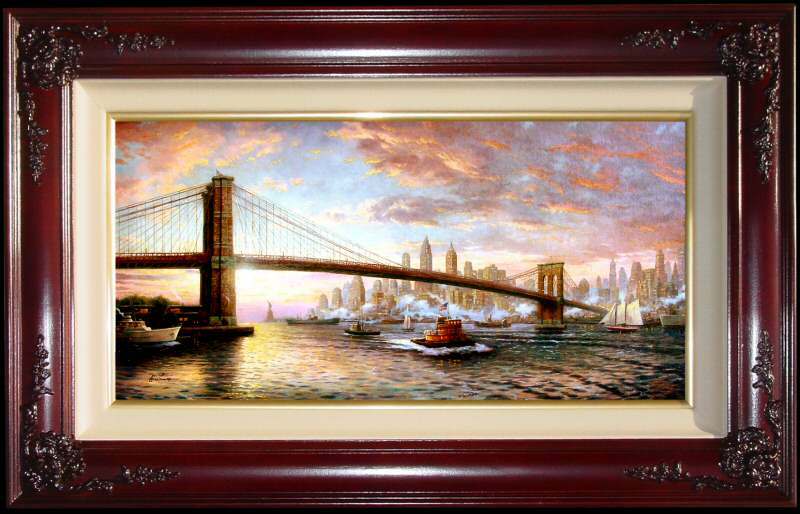 This panoramic view depicts The Spirit of New York - a mix of courage, resolve and an indomitable sense of celebrating life in all of its diversity. 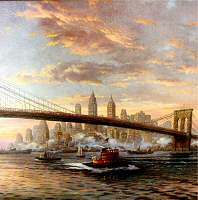 In addition to Thoms tributes to our country (with the inclusion of several flags), his wife and daughters (whose names all appear on the many boats in the image), and his 25 year marriage to Nanette (by including their anniversary date on the tug boat), There is tug boat making its way under the Brooklyn Bridge, the Manhatten skyline looks beautiful and the Statue of Liberty is there as well. The Spirit of New York is being released in an SN edition size of 1750 in 3 sizes and a Monumental edition size of 75. ++++ Thom created this painting in 2006. ++++ Brass Plaque with the legend "The Spirit of New York ~~ Thomas Kinkade"
On a recent trip to New York with my family, we got a chance to boat on the East river, enjoying seldom seen views of the city. As I savored the sights, I began to sense the pulsing rhythm of this great metroplis. It dawned on me The Spirit of New York -is a mix of courage, resolve and an indomitable sense of celebrating life in all of its diversity. As I gazed up at the mighty Brooklyn Bridge, I realized that this cast panoramic view of the city is alive with the energy and vitality that makes New York unique in all of the world. 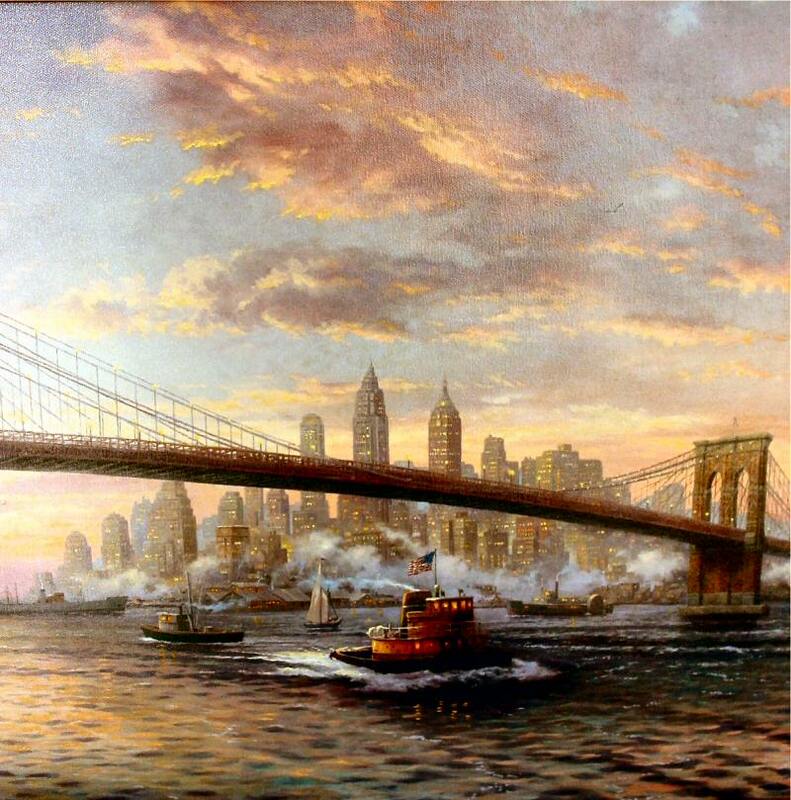 What image could better summarize The Spirit of New York in all its radiant energy? 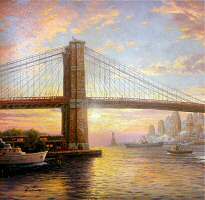 As I labored on the Epic canvas (over 6 feet in length and three feet in height) I came to see the many boats upon the East river as somehow symbolic of the many facets of New York. The humble harbor tug flying 'Old Glory' the hardest working boat on the river~~ expresses New York's tremendous resolve in the face of challenges. Cargo ships remind us of the economic power of this busy port, whilke a miliary vessel suggests the power of heroism resident in the great city. In the distance, a vintage East River ferry harkens back to New York's colorful history and an array of pleasure boats on the river confirms that the city still knows how to throw a party. In the far distance, Lady liberty still holds the torch of Freedom high, while clouds dance overhead like a legion of angels, guarding the jewel beneath."